Refreshments during the hot summer! Servcorp hands out cool sweets and drinks to its office clients! In order to support Servcorp clients, who are always working very hard, Servcorp staff periodically goes around each of the offices to hand out sweets and drinks. Being that it is summer, this time we prepared things that were refreshing. Please enjoy the reports from each of our locations! At NOF Hakata Ekimae Building, the staff handed out ice cream to help clients fend off the relentlessly hot summer. 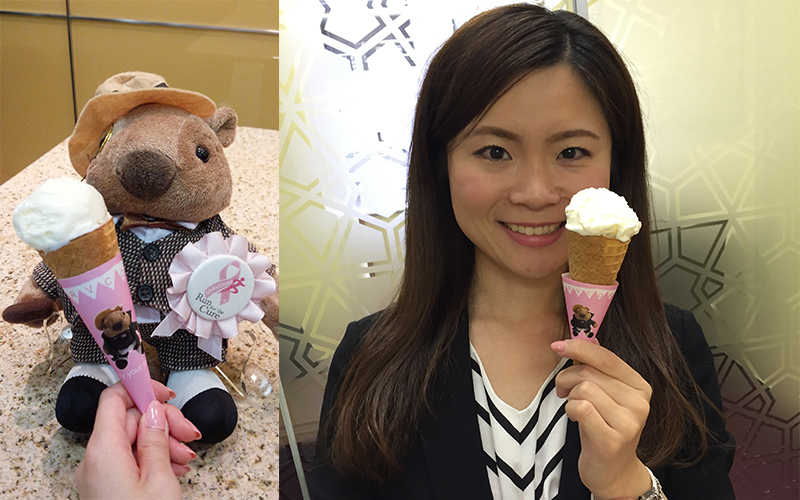 The sleeve wrapped around the ice cream cones was a handmade design from the staff featuring Sidney, the mascot of Servcorp! At NOF Hakata Ekimae Building, we're always trying to come up with ways for our clients to take a moment to catch their breath. Please look forward to next month as well! 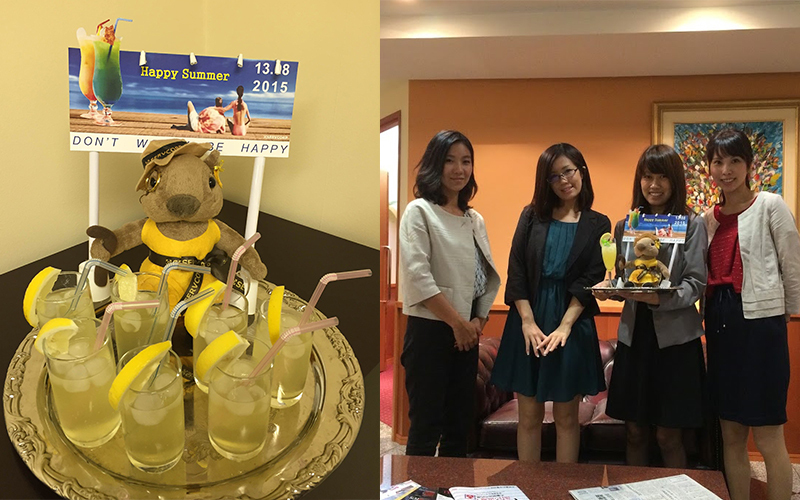 At Nagoya Nikko Shoken Building, the staff prepared Sparkling lemon juice garnished with lemons for clients. In keeping with the lemon theme, Sidney's friend (not Sidney the Servcorp mascot) wore a handmade lemon themed outfit, complete with a yellow dress and earrings. Also, do you recognize the billboard behind Sidney's friend? It's a parody from one of the billboards in “Long Vacation”, a television drama which took Japan by storm. The staff made this so that, in addition to distributing refreshing drinks, they could also create a summer atmosphere the clients could enjoy. The staff received a lot of happy comments such as, “I love how summery it is!”, “On hot days this lemon sparkling drink makes me happy and really clears my head”, and “When I nibble on the lemon slices, I feel refreshed and I can continue to work hard”. It seems that there were many clients who were working during the Obon holidays (a common vacation period in Japan). We hope our clients can get refreshed with some juice and get through the work week. 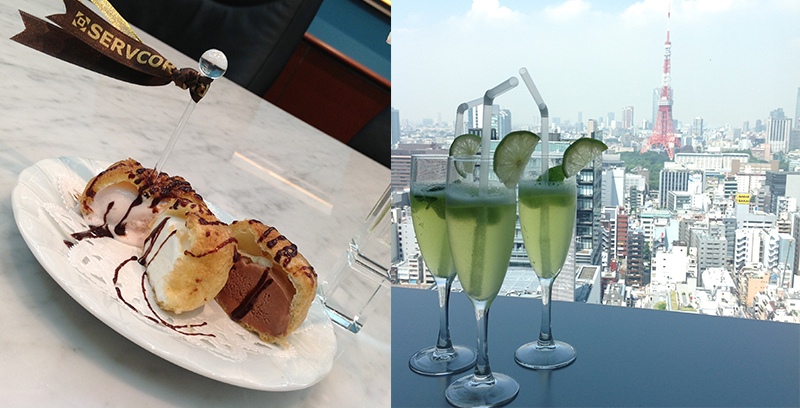 At Shiodome Shibarikyu Building, the staff prepared refreshing cocktails and cream puff with ice cream filling to help clients beat the heat. In June, cream puffs filled with vanilla, strawberry, and chocolate ice cream were served, each topped with chocolate sauce. We were thankful to get compliments from clients who remarked that the dessert looked like something from a fancy restaurant. Especially for those clients who had just come back in from the outside where the sun was blazing hot, it appeared that they have thoroughly enjoyed the ice cream! In July, in keeping with the colors of the Shiodome office, refreshing emerald green cocktails were made using green apple sherbet mixed with soda water and topped off with a lime garnish. These icy cool drinks were a big hit with the clients. Some clients expressed their appreciation with one client saying, “It's so refreshing and delicious” and another saying, “I was really dying in this summer heat, but I think now I'll be alright”. Although it seems like these hot days will continue, we'll keep on working our hardest to provide a nice environment for all of our clients. Thank you! 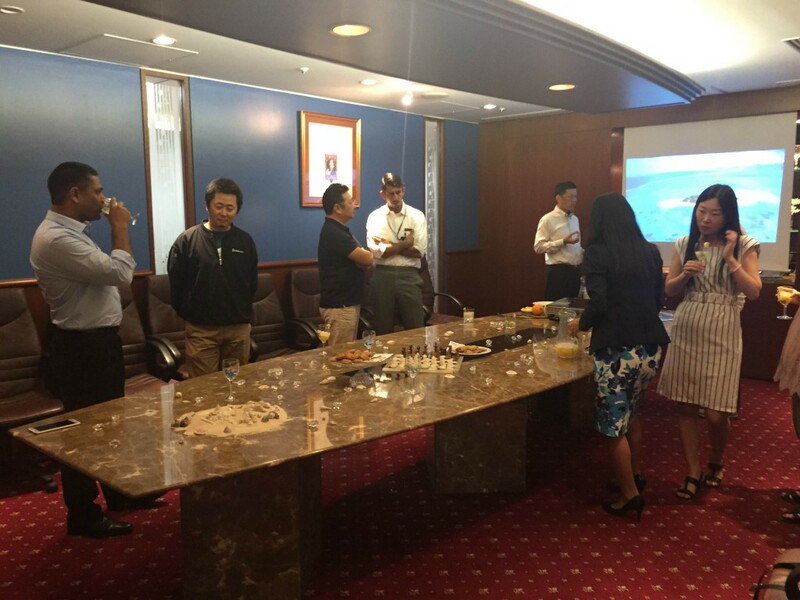 At Hibiya Central Building, fruit punch and mojitos with cookies were prepared for the clients. The staff at this location always visits clients' offices bringing various treats, but this time they decided to do something a little bit different by gathering people in the boardroom. The boardroom was turned into a fabulous beach. 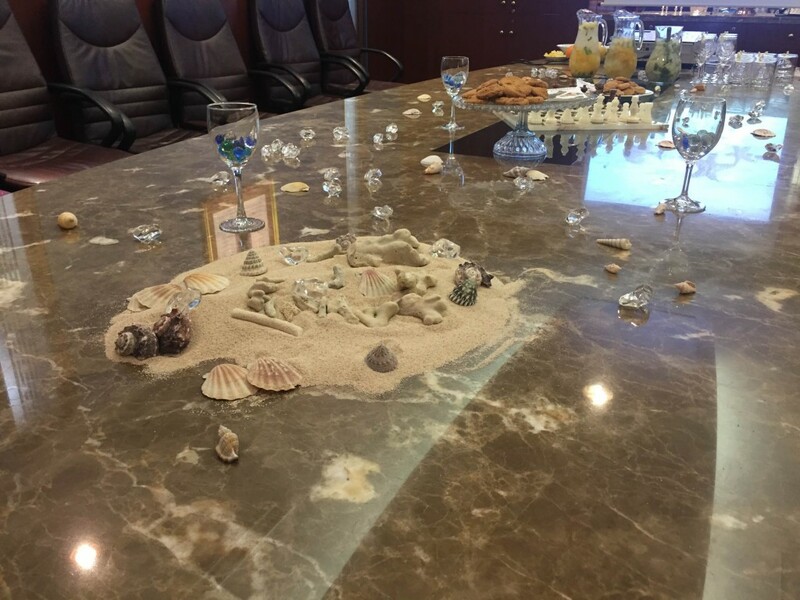 The boardroom's monitor showed pictures of the beach and the table itself was decorated with sand and seashells! The transformation of the Servcorp boardroom into a beach theme was very popular among the clients who remarked things such as, “This drink is just perfect for summer” “The visuals and the music also fit summer just right”. 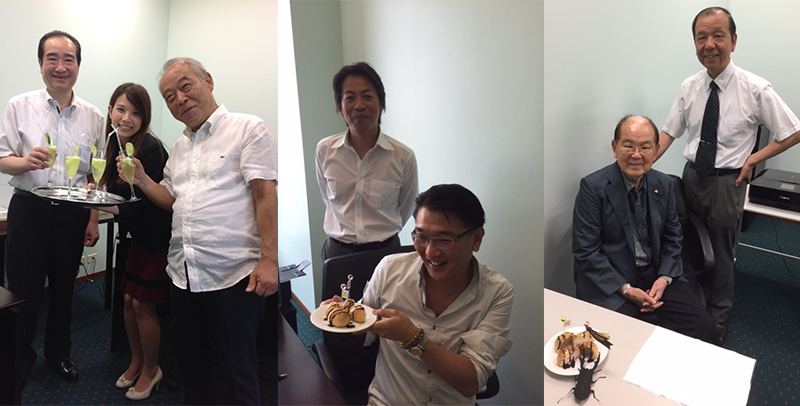 The Hibiya Central Building staff would like to give a big thank you to all those that participated despite their busy schedule!